Digital Family Vol. 2 is the second forward-thinking compilation from Digital Diamonds, one of the world’s leading techno and trance netlabels. This state-of-the-art collection features eleven jewels of electronic music selected by Alic and representing almost all of the core members of the Digital Diamonds roster. These moody, introspective, futuristic, and experimental works will delight your ears and shake up dance floors wherever they are played. Cover artwork by JP-Huss. MP3 Download | FLAC Download | WAV Download · Download count: 19,087. Released under a Creative Commons licence for noncommercial usage. 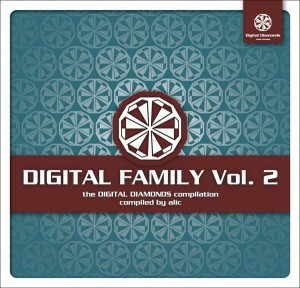 Be sure to download the first Digital Family compilation to hear more great music from Digital Diamonds. You are also encouraged to leave some feedback about this release. good time good music deep dark intelligent dance music im flying higth rigth now whit this stuff !!!! yes some mesmerizing grooves in that fine collection of minimal electric collection. Ektoplazm got the best releases as usual)) Basilisk rules) keep goin!